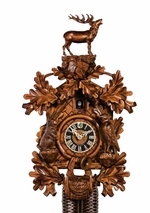 The birthplace of the cuckoo clock was the Black Forest in southwestern Germany. Ever since, cuckoo clocks made in Germany have been held at a high standard, exhibiting authentic craftsmanship and tradition that have been passed down for over two centuries. Modern twists, like quartz crystals and digital recordings, have improved some of the timekeeping elements and presentation, but the general elements of cuckoo clocks from Germany remain the same. My Cuckoo Clocks is home to a wide selection of German cuckoo clocks that feature beautiful melodies coupled with intricate handcrafted designs and expert German horology. Take a look through our store, and feel free to contact us if you need help finding the perfect German clock.